For many, latkes need no more than a dripping of sauce from a pot roast or brisket, a spoonful of apple sauce or maybe a shmear of sour cream. Then there are folks who like their latkes sprinkled with a bit of sugar. But for those who want to try something new this Chanukah season (or really any time), below are some recipes to plop atop their potato pancakes. 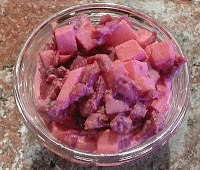 The Apple and Red Onion Compote adds savory but still sweet flavor to complement the rich taste of the fried potatoes. The Apple, Beet and Horseradish Topping is reminiscent of borscht with all the trimmings. The flavor combination is based on a salad of fresh shredded beets and horseradish I once had in a Ukrainian restaurant on the Lower East Side in New York. Be sure to use the plain, white prepared bottled horseradish without cream or beets. 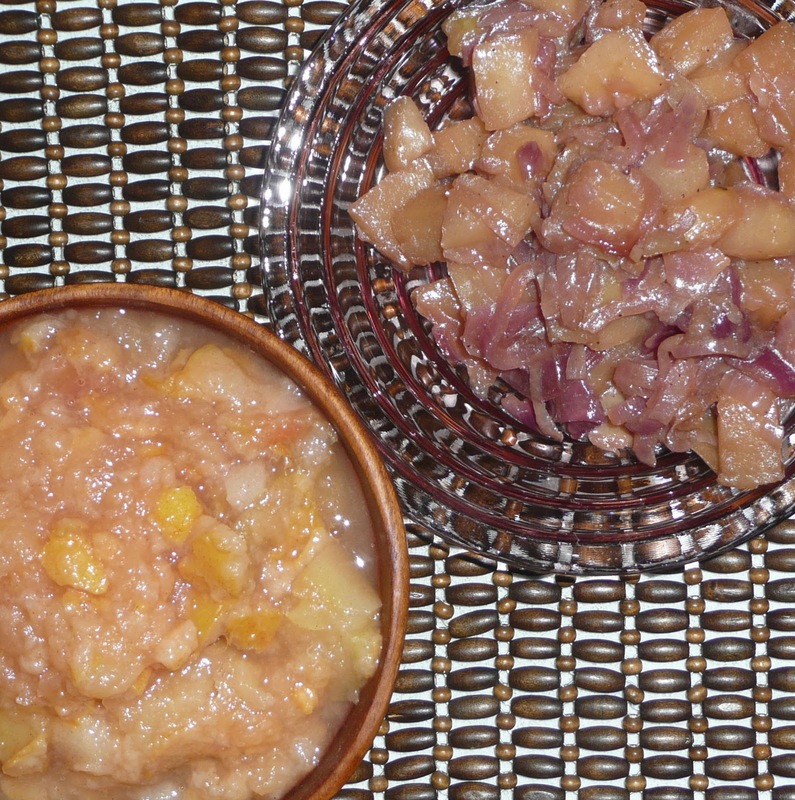 I like the Apple Pear Sauce best with unpeeled fruit, but peeling is an option if you prefer. Finally, the Apple Cinnamon Sour Cream Topping was developed by Green Valley Organics of Sebastopol, CA, for use with its kosher, lactose-free sour cream, but I think it works well with regular sour cream, too. Slice onions very thinly and then cut slice in half. Heat oil in large pan, Sauté onions over low heat until very soft, add apples and apple juice, raise heat to medium high. Bring to a simmer, stirring occasionally. Add sugar, salt, cloves and coriander. Cover and continue to simmer, stirring occasionally, until the apples are very soft but not mushy, about 30 minutes. Remove lid and raise heat to high and cook, stirring, until all the pan juices have thickened and the mixture is no longer liquid. Serve warm or at room temperature. Chop apple into 1/4” pieces, mix with lemon juice and drain. Chop beets into 1/4” pieces, mix with drained apples. Stir in horseradish to taste. Refrigerate. Just before serving, pour off any liquid and mix with sour cream. Serve immediately. Core and cut apples and pears into 1” cubes. Toss with lemon juice. Put in medium pot with juice over low heat. Cover and cook at a simmer. 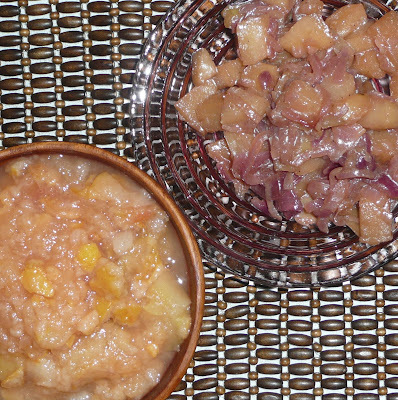 Using a heavy spoon, stir, mash and break up pieces of the fruit occasionally as the sauce cooks. Once the fruit is very tender, about 30 minutes, (peeled fruit may require less time). Remove lid, raise heat to high and simmer for 10 minutes to thicken juices. Serve warm or at room temperature. For a non-dairy option, try plain soy yogurt. Mix sour cream, applesauce, brown sugar or agave, cinnamon and salt together. Roll shredded apple in a clean kitchen towel and squeeze out excess water. Stir drained apple shreds into the sour cream mixture. Adjust seasonings to taste and refrigerate until ready to serve. The version of this post originally appeared in the j. weekly. Need recipes, suggestions, background on Chanukah (Hanukkah) - check out my round up here. Just a note to say I enjoyed your posts, came across them from a food industry blog list – really glad I found your site. Thanks for writing.